Bryce Harper, Manny Machado, Dallas Keuchel, Craig Kimbrel—the list goes on for offseason names, but which of these players will receive the contract they actually want? Pitchers and catchers first report on February 12, but none of these players have chosen a team and that is hurting both them and the fans. First of all, the memory of J.D. Martinez’s failed expedition to attain a seven-year $200 million contract should be fresh in these players’ minds (Martinez ended up acquiring a five-year $110 million contract with the Boston Red Sox, far less money than what he originally wanted). “Fans will root for the player no matter when they sign a contract,” added Arnold. 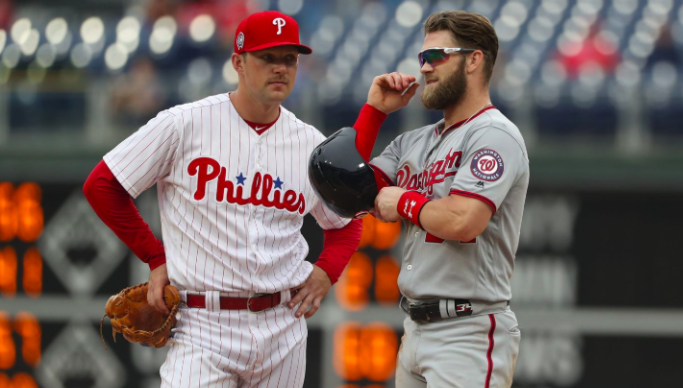 A picture of two bats with Philadelphia Phillies’ logos and Harper’s name and number 34 circulated on Twitter on Monday, January 28. Many fans and analysts are speculating that the image means that Harper will sign with the Phillies. The waiting game might not be the only part of this process hurting players. Baseball simply is not bringing in enough money for teams to be giving out $200, $300 million contracts anymore. Frankly, after the New York Yankees’ experiments with Brett Gardner, Jacoby Ellsbury, and Giancarlo Stanton (giving players upwards of $100 million for over seven years) and the Los Angeles Angels of Anaheim’s franchise-crushing contract with Albert Pujols, the odds of team following in their footsteps are unlikely. Kimbrel is looking for a six-year contract for at least $100 million, but he is not receiving the interest he hoped he would. The best interest the World Series Champion closer has gotten is a potential three-year deal from the Minnesota Twins. The Houston Astros want Keuchel to return to their squad, but the Cincinnati Reds are making a serious bid for him. Scott Boyken, Fansided’s Reds’ beat reporter said that, “Following his trade to the Cincinnati Reds earlier this week right-hander Sonny Gray agreed to a three-year $30 million extension. The numbers suggest he’s similar to remaining free agent ace Dallas Keuchel.” The Reds spent $30 million on Sonny Gray and Boyken says that they are likely to spend that for Keuchel ($10 million per year). Machado is getting interest from many teams including the Yankees, Phillies, Chicago White Sox, and San Diego Padres. Machado entered the offseason looking for essentially the same deal Stanton made in the 2017-18 offseason, a 13-year commitment for $325 million. Spring training is 11 days away, but the fans still have no idea which players they will be rooting for.